In an effort to combat the economic conditions that have plunged one-fourth of its population into poverty, Egypt’s ambitious development plan for a massive new capital city is soon to be underway. Roughly the size of New Cairo, the privately-funded city hopes to become the new administrative center, as well as a bustling metropolis of shopping, housing, and tourist destinations to generate economic activity. Plans were solidified at a foreign investment conference where the official project details were unveiled on March 13 in Sharm el-Sheikh. Read on after the break for more on the $45 billion plan. 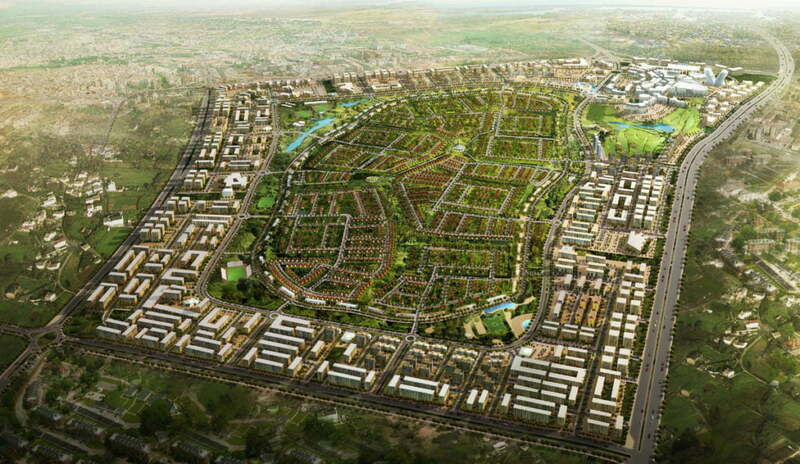 Aiming to “build national spirit, foster consensus, provide for long-term sustainable growth,” and tackle some of Egypt’s most pressing issues, the New Cairo master plan consists of several medium- to high-density communities. These will rely on a mixed-use structure to stimulate economic growth and reverse unemployment, combining residential functions, shops, cafes, schools, recreational areas, industrial zones, and religious institutions. This, coupled with the relocation of Egypt’s governing bodies and foreign embassies, will make the currently unnamed city an economic and political powerhouse. “We’re talking about a very big city… It is the ‘new New Cairo,’” commented Ashraf Salman, Egypt’s Investment Minister. Occupying over 270 square miles, the plan will take five to seven years to construct and is comprised of dozens of projects in various sectors. It will ultimately shift Egypt’s density from Cairo eastward toward the Suez Canal, providing housing for five million residents and lessening congestion in the current capital. Despite Egypt’s slow economic growth over the past few years, the country is seeking foreign investment to jump start the revitalization process and reach its goals of achieving annual growth rates of 6% in the next five years. At the investment conference, the master plan quickly garnered financial pledges in the amount of $4 billion each from the United Arab Emirates, Kuwait, and Saudi Arabia, who in the past year and a half have been key investors in Egypt’s economy. Although it is clear that the road to economic stability will be arduous, Egypt is confident that this plan for an “Egyptian Renaissance” will be a solid first step for New Cairo. Story via Al Jazeera, The National, BBC, and The Capital Cairo.